BREWSTER -- A seeing-eye dog is being hailed as a hero after he saved his blind owner from being hit by a mini school bus in Brewster, New York, Monday. The incident happened on Michael Neuner Avenue, while the bus was transporting two kindergartners. 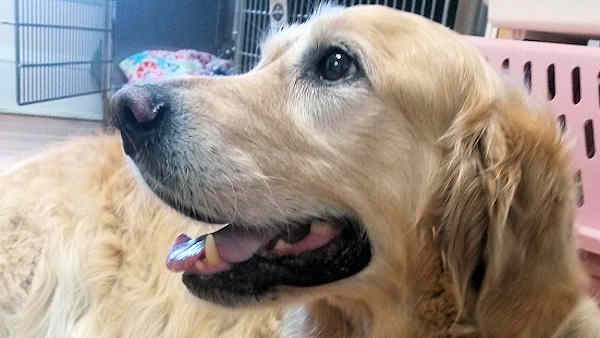 Bigo, a golden retriever, apparently threw himself between Audrey Stone and the vehicle. The Journal News reports that police photos show the dog's fur stuck to the front of the driver's side wheel and in the street. The woman suffered a broken elbow, ankle and ribs. Police say Bigo's leg was cut down to the bone. The bus driver told police he didn't see the pair crossing the road. No one on the bus was injured. Paul Schwartz, who manages a nearby gas station, says it looks like Bigo tried to take most of the blow.